In this month's Canada Craft Club delivery, I received a 650ml bottle of Organic Abominable Winter Ale from Hopworks Urban Brewery (HUB). 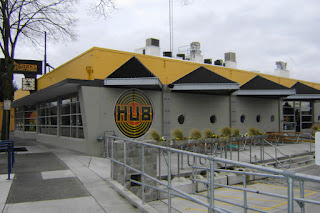 The brewery opened in 2007 in a city that is very high on my list pf places to visit, Portland, Oregon, which maybe the craft beer capital of the world. The family owned brewery, started by Christian Ettinger very small, now employs over 130 people in two brewpubs. In December 2012, the Oregon Sustainability Board presented the brewery with the Governor’s Oregon Sustainability Grand Champion Award which promotes the use of sustainable practices in the private sector. When looking at notes on the Abominable, I noticed they use Salmon safe hops. Salmon safe hops .. what? Salmon-Safe is a non-profit organization that works to keep agricultural watersheds and urban areas clean enough for native salmon to spawn and thrive. The Organic Abominable Winter Ale pours brown with a slight orangy hue and white head. Lacings, of course, line the inside of the glass after each sip. There is a definite pine aroma to the nose. The ale starts with a nice little bitterness, maybe a little citrusy, before a fabulous pine bite takes over. I have been craving pine needle bitterness lately and this ale has it. It is not an overpowering bitterness but nicely balanced. The Abominable is dangerous as it is delicious but goes down easily like a session ale, but comes in at 7.3% APV in a 650ml bottle. I really wish I had another as I really enjoyed the one I received.